Since David Gilmour joined Pink Floyd in 1967, his guitar work was, to say the least, legendary. From his explosive solos on the live sides of Ummagumma, to the legendary radio hits Comfortably Numb and Money, few guitar solos in rock are better known. Now, 120 of Gilmour's guitars, including his legendary 1969 Black Fender Stratocaster (so customized by Gilmour that an entire book was devoted to it) will be auctioned off at Christie's in New York this June. Calling it the “largest and most comprehensive collection of guitars to be offered at auction,” Christie’s has dubbed the event the “The David Gilmour Guitar Collection” and it will be on view at the Christie's London showroom from March 27-31, in their Los Angeles showroom May 7-11 and finally in New York City June 14-19, after which the auction will take place. 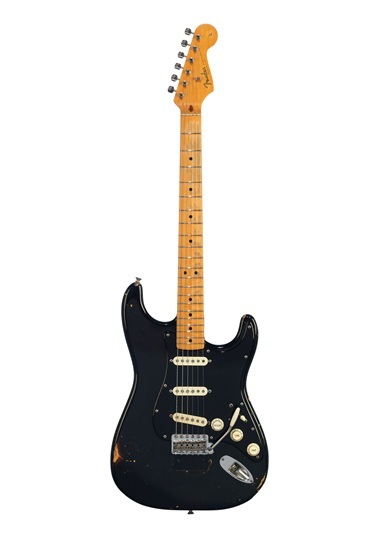 "Between 1970 and 1986, The Black Strat was Gilmour’s primary performance and recording guitar, and was key to the development of the Pink Floyd sound. It was played in the recordings of landmark albums such as the 1973 masterpiece The Dark Side of the Moon, which includes the track Money and is widely regarded as one of the greatest LPs of all time; Wish You Were Here (1975), featuring the track Shine on You Crazy Diamond, which Gilmour reveals ‘came out of’ The Black Strat; Animals (1977); and The Wall (1979), which features Gilmour’s legendary guitar solo on Comfortably Numb. "The Black Strat, which has been extensively modified over the decades to accommodate Gilmour’s evolving style and performance requirements, can also be heard on his critically acclaimed solo albums including David Gilmour (1978), About Face (1984), On an Island (2006) and Rattle that Lock (2015). On 20 June at Christie’s in New York, this iconic, solid-body electric guitar (estimate: $100,000-150,000) will be a highlight of The David Gilmour Guitar Collection.". 1954 White Fender Stratocaster with the serial number #0001, played on "Another Brick in The Wall (Part 2)"
The auction of David Gilmour's guitars is not only one of the largest sales of guitars ever offered, but it also details the musical history of one of rock music's most legendary guitarists and bands. What an exciting event.